Psychology of reading, development of reading skills, and cross-cultural issues in education. his current research focuses on (a) modeling eye-movement programming during reading and using eye movements to detect reading difficulties; (b) how children learn spelling-sound correspondences; and (c) learning to read in different writing systems, such as English and Chinese. 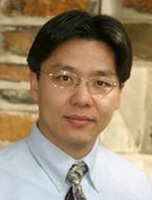 Feng, G. (2006). Reading Eye Movements as Time-series Random Variables: A Stochastic Model. Cognitive Systems Research, 7(1), 70-95. Feng, G. (2003). From Eye Movement to Cognition: Toward a General Framework of Inference. Psychometrika, 68, 551-556. Feng, G., Miller, K., Shu, H., & Zhang, H. (2001). Rowed to recovery: The use of phonological and orthographic information in reading Chinese and English. Journal of Experimental Psychology: Learning, Memory, and Cognition, 27, 1079-1100.